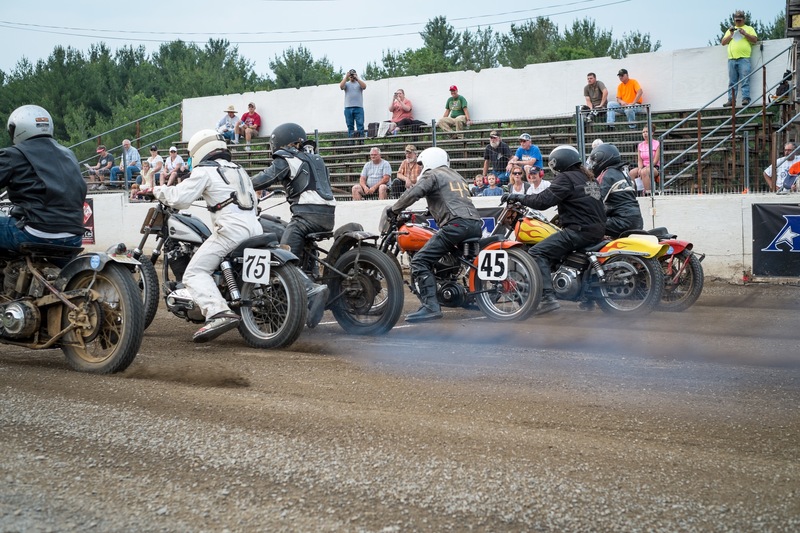 June is always an exciting month in Central NY, summer is on its way, schools start their summer vacations, and most importantly it’s AMA Vintage National weekend at Square Deal Riders In Port Crane, NY. 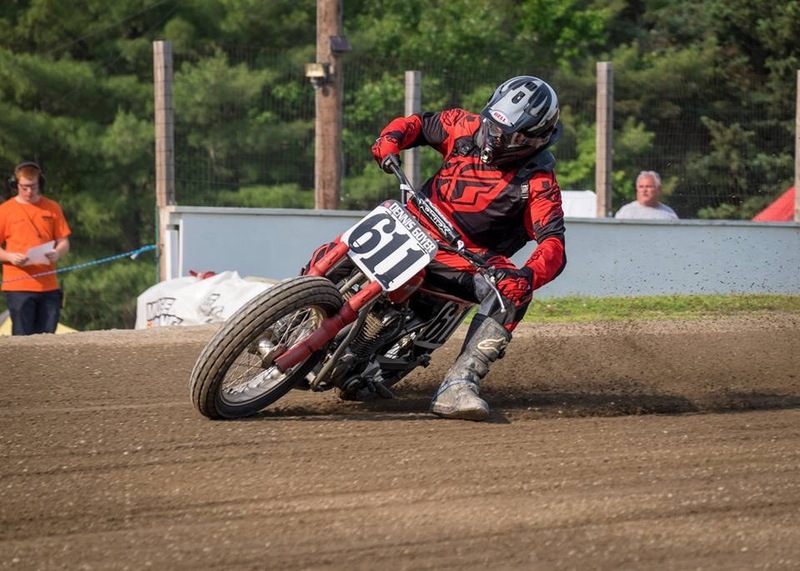 The second weekend in June SDR host rounds 7-8 of the AMA Vintage Flat track National Series. This fast 1/4 mile track is the perfect place to hold a national event like this. 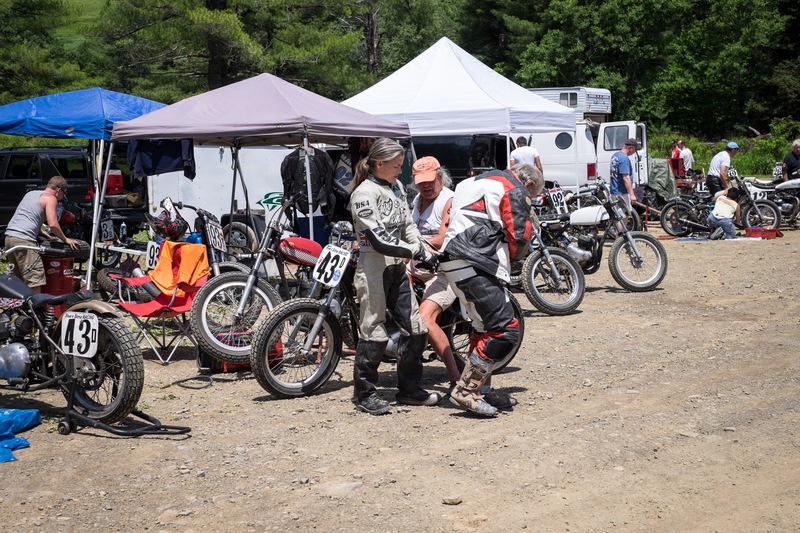 Riders come from all over to compete on their vintage iron against some of the best in the buisness. 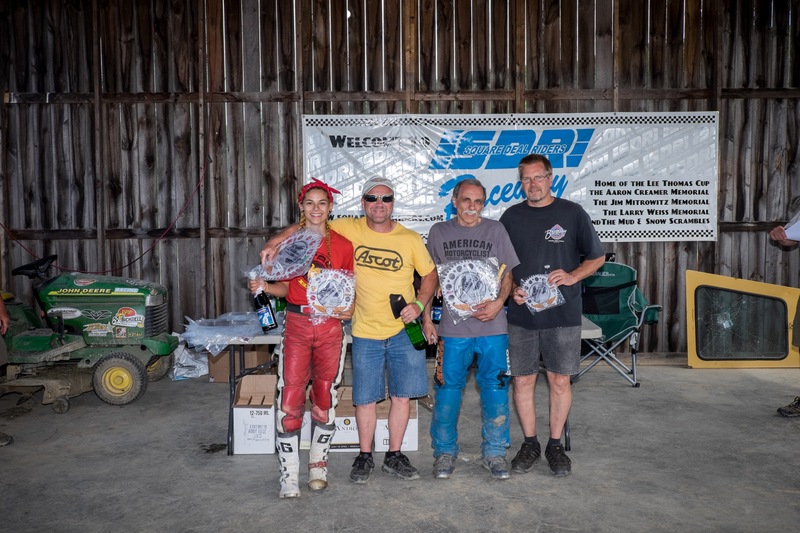 Past years this event has welcomed former AMA Grandnational champions like Jay Sprinsteen, On any Sunday’s star Mert Lawill, Bubba Shobert, and 9 time GNC1 National champion Scotty Parker. Don and Peg Miller from Metro Racing brought these heroes of the sport to central NY every year for fans to enjoy. Friday night at SDR is round 7 of the vintage National series. Saturday is round 8 along with the annual Larry Weiss memoial race. The club has one of Larry’s bike In front of the podium, and all the the winners tradionally spray champagne on the bike after their event. The winner of the Weiss race also gets to keep the unique trophy for a year to show off to friends and family. Craig Estelle has been the man to beat for the last four years in this popular race at SDR. Friday night the pits had well over 100 entires for the vintage national. 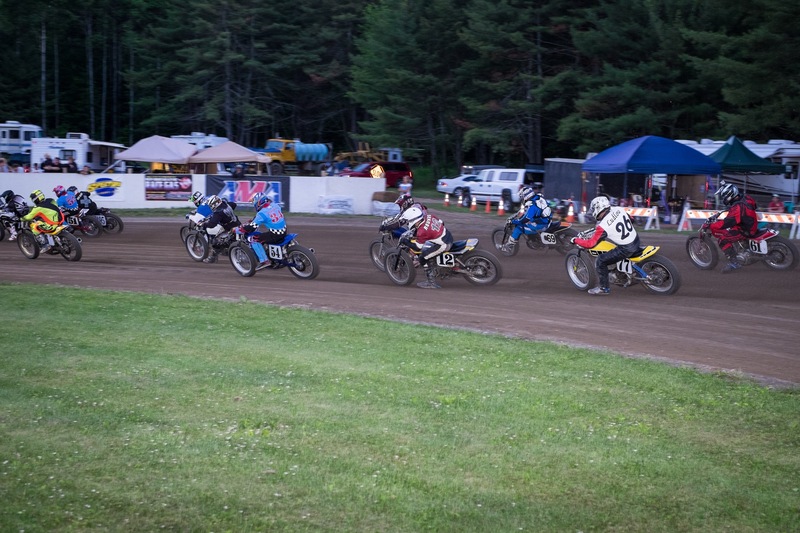 All of the riders compete on old flat track bikes in a variety of different classes. From brakeless ( yes I said brakeless) to the crowd favorite, all Harley Davidson class. Theses guys are crazy. Some of these bikes are really rough looking, but boy do they put on a good show. Every year this class has grown and grown. Some of these bikes look like they rode them there, remove a few lights and bolted on a number plate. Friday night there was weather coming later in the evening, so the SDR crew ran the show as best they could to beat the rain. After all of the heat races and LCQ’s were ran, it started to get dark to the north. Rain was really close, so they went into the features, planning on going as long as they could. Right after the first main was complete, lighting started to fill the sky, and the wind started to pick up as well. The track decided to call it off for the night and start again up Saturday afternoon. Saturday was a perfect day for racing. Temps in the lower 80’s and low humidity. 1:00 pm the first race of the day was on the track for their feature event from the night before. With the sun beating down on the track, it didn’t take long for it to dry out. Mike Williams stayed on top of the track prep all day keeping it nice and racey for the Vintage riders. 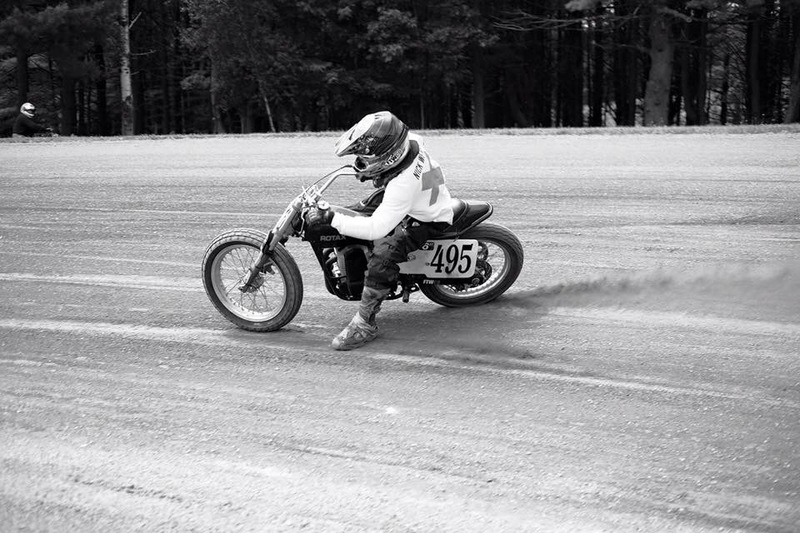 Not only was Mike busting his back with the track he also was riding a Rotax owned by fellow rider Dennis Goyer. Saturday SDR ran 12 main events to finish off the AMA National race from the rain out Friday. Everything went well for most of the riders, there were not any major accidents or too many restarts. SDR members Handed out very cool plaques, and a bottle of champagne to all (over 21) that finished on the podium. Soon after the awards ceremonies, the hard working crew started taking sign ups for the nights Larrry Weiss race. Saturday there seemed to be a few more bikes in the pits then on Friday. Like years past the completion was fierce in all of the classes at SDR. The stands started to fill up around 5:00pm for a 6 o’clock start time. The parking area is like its own motorcycle show with beautiful road bikes. If you ride a bike to races you pay only $5 admission, how can you beat that? You can’t! With all the cash you save at the gate you can feed the family at SDR’s brand new “Holeshot”. They offer 1/2 chicken dinners, sausage, hamburgers, hotdogs, and ice cold drinks. If a snack is all you need then you can visit the Club house and grab a bag of popcorn, or some sweet treats to satisfy your cravings. While you are in the Club House you can look through some pictures, and check out the history behind the Motorcycle club. SDR was established in 1937, and is still going strong. I highly recommend taking a ride to SDR to watch a race some time this summer. You won’t be disappointed. Ok back to the racing action. After the riders meeting all of the riders filled the lanes to get a few laps of practice before the heat races hit the track. Most nights after the sun goes down the track holds the moisture verywell making for a high bite track. Mike socked the water to the 1/4 oval soon after practice and dragged the track a bit. Making it was brand new again. I almost forgot. the last few years there hasn’t been a special guest appearance at the National, but still a ton of great racing both nights. This year SDR had a very well known National Champion in the pits by the name of Chris “The Prince Of Peioria” Carr. For the last couple years Chris has been selling “Goldentyre” motorcycle tires at SDR. It’s been pretty cool seeing him at the track, but now everybody gets to see him race.😎. Carr was piloting two Bultaco motorcycles owned by the Hawkins Brothers, in a few different classes. Chris won all four classes he entered both nights. He looked like he was having a blast racing these bikes. In a interview with Joe Brombley from AMA he stated that he had been getting the itch to ride something different at SDR, well I guess he scratched his itch, in these Bultaco’s. With all of the qualifying races in the books, it was time for the for the long awaited Larry Weiss Memoriable Race. Eight laps of pure excitement for both riders and fans. Like every big event at SDR the riders and mechanics pushed their bikes out onto the from stretch in front of the fans. This is really cool for the fans to see what their favorite rider looks like without a helmet on. Each rider is introduced, and thanks their sponsors on the mic before they fire their vintage machines. Three rows made up the field with most of the fast guys on the front row. Anybody that started on the other two rows had their work cut out for them with only eight laps to get it done. The crowd rises to their feet as the bikes revved up anticipating the green light for the start of the race. I position my self in turn one trying to get a shot of the gaggle of bikes looking for the lead. 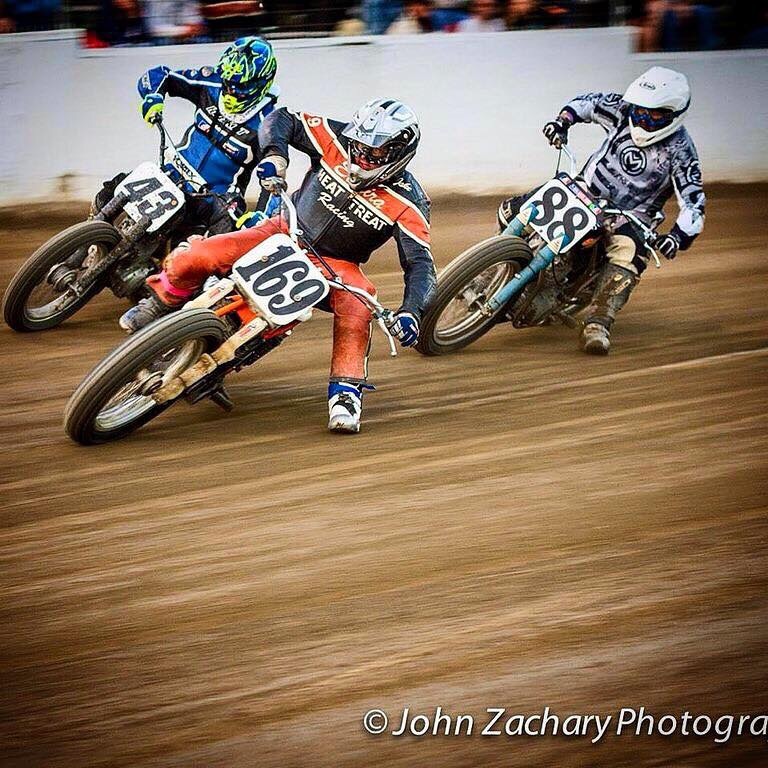 By the time the pack entered turn three long time Flat track rider Shane Livingston was out front, and looking to go hide for eight laps. #495 Nick Weimer, #43 Kyle Zajaceskowski, and #51 Craig Estelle were going to make sure Shane didn’t get out front to far. After Estelle worked his way past Weimer, and # Zajaceskowski he set his sites on the #73 bike of Livigston. With such a stout field every move was huge in this short race. With less than three laps left, Craig pulled within a bike and1/2 from Livingston. Shane held his line on the bottom,making sure anyone who wanted to get by him, had to do it around the top. The track was good on both the top and bottom, but it was Shane’s night. 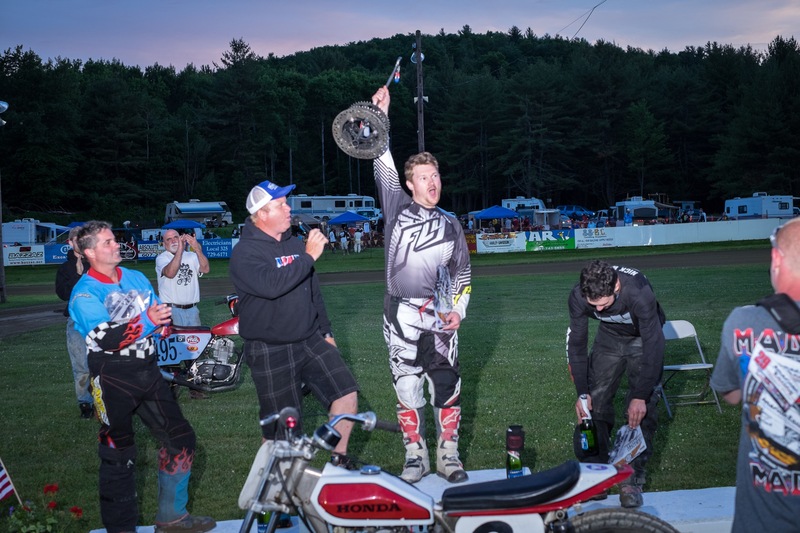 He rode his #73 Rotax to his second Larry Weiss Memorial victory. The night went great for most of the riders. 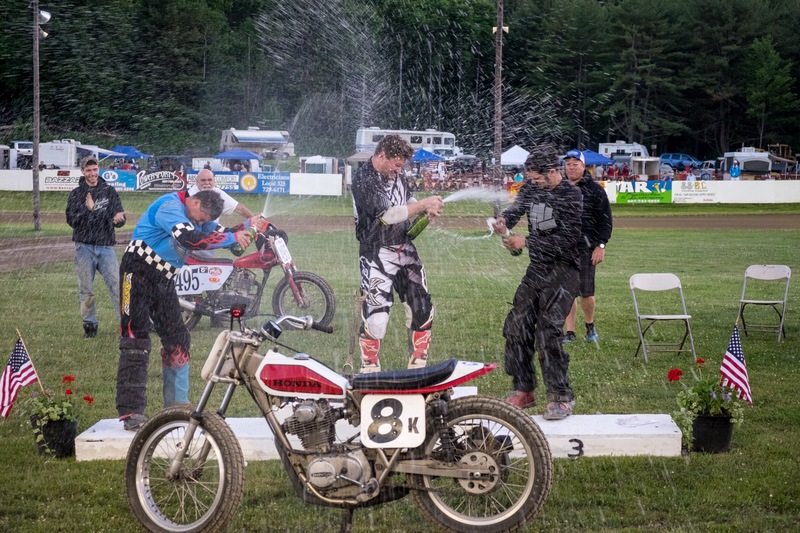 Carr won two more mains, and more champagne was sprayed on Larry’s motorcycle. Once again SDR put on an epic show for fans and competitors alike. All the racers I spoke with agree, they love racing at SDR and plan on visiting again soon. 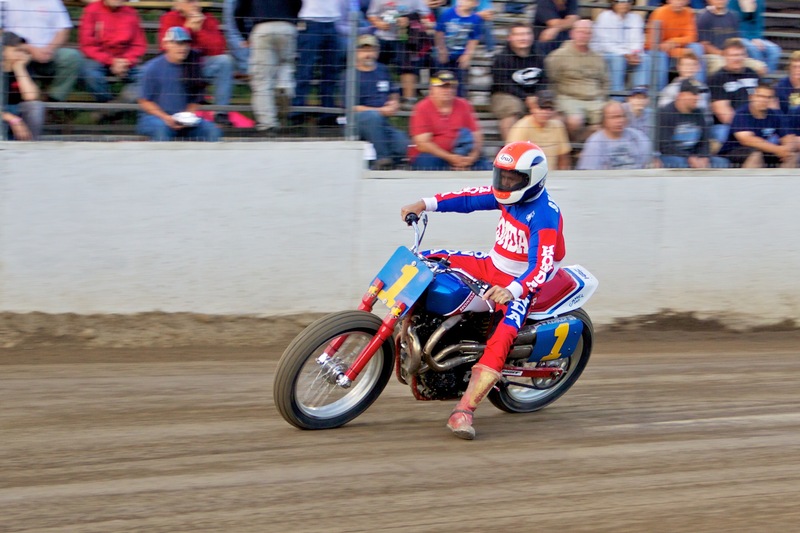 So I say check out the Flat Track schedule on their website, and plan on a night of bar to bar racing. 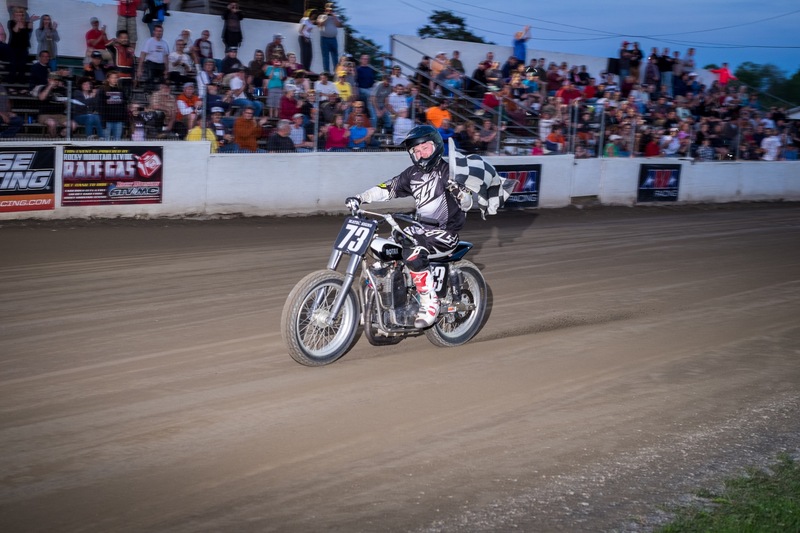 Harley Davidson presented the first ever Flattrack event in the XGames. 20 years of X has been filled with all kinds of sports from skate boarding, Street luge, motorcycle step up, and BMX big air. It seems like that last few years motorsports have been creeping into this popular event more and more. Now this year with Flattrack the trend continues. The XGames crew trucked in tons of clay to create the battle ground for the two wheel warriors at the 2015 XGames. 24 riders entered this event trying to be the first to take home the gold in this addition to Summer X. They would to battle on a 3/8’s mile dirt oval, that was built in the middle of a field in Texas. With all the rain in the lone Star state, it made it a bigger challenge for the track builders, but they did a great job with what they had to work with. #10 Johnny Lewis had a great run on his Ducati finishing 4th just outside a metal. 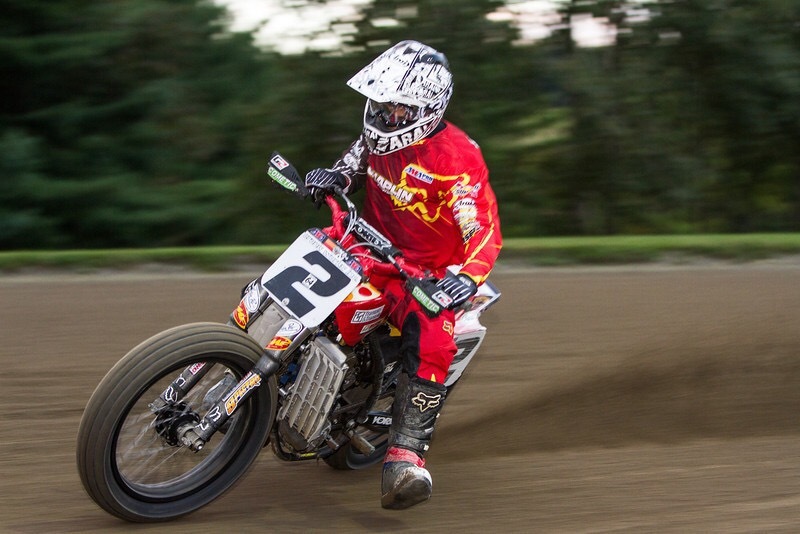 24 of the sports top riders were on hand competing in two 14 lap heat races. Five riders would move onto the Metal round from the qualifying races, and the rest would have to go through the LCQ ( last chance Qualifier). Only two riders would advance to from the LCQ to the main event. 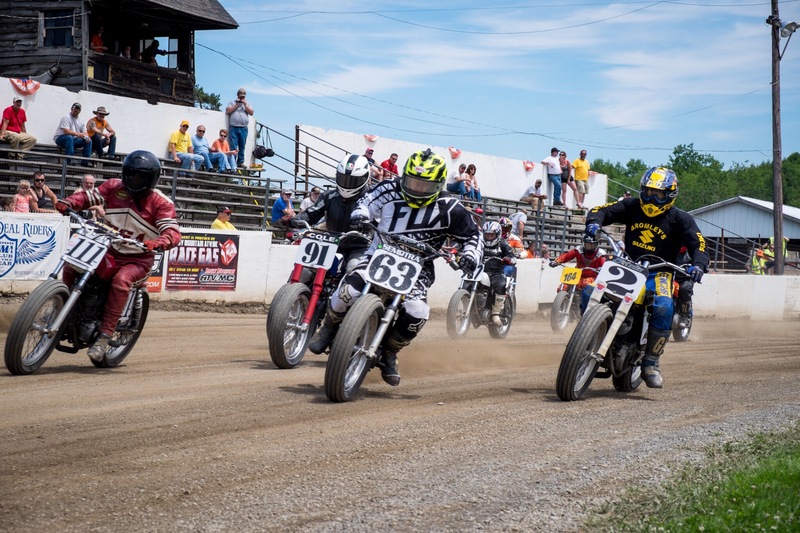 Of course the XGames added a little twist to the Harley Davidson Flattrack race by having each race start with a MX like starting gate. 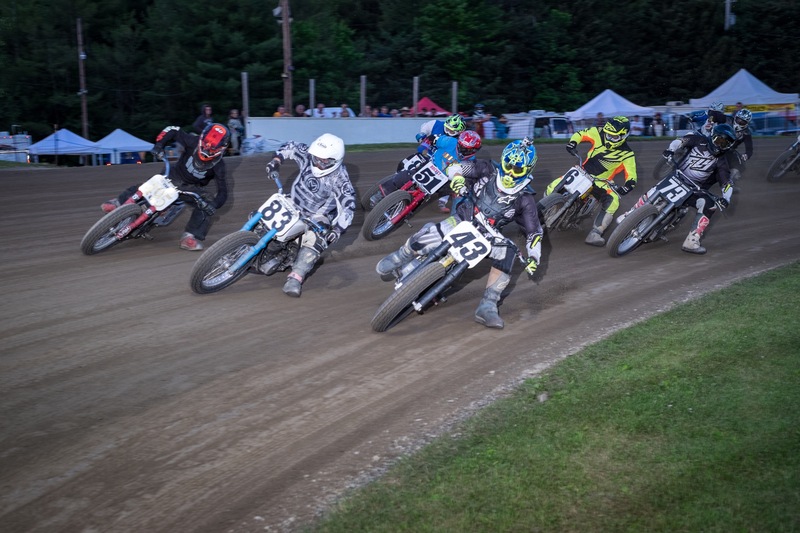 Normally at a AMA Flattrack event, the riders line up in rows across the start finish line. They line up handle bar to handle bar waiting for a green light before they leave the line. Not only did they have added pressure on them just from the prime time event itself, but also a new way to start a race on these 300lb beast. Twelve riders lined up at the starting gate in two heat races to open this years XGames. In heat one the gate dropped, and the competitors charged down Into turn one, jockeying for one of the top five transfer spots to the main. After all of the rain that Fell on Texas the freshly made track was a little rough, but definitely good enough to put on a great show. 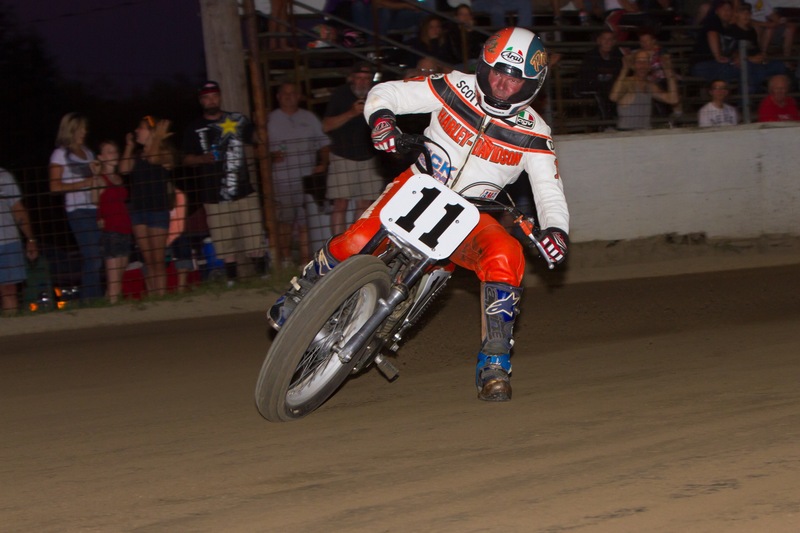 #1 defending Grand National Champion Jared Mees got the hole shot on his Harley, with factory Harley Davidson rider #6 Brad “The bullet ” Baker hot in his heels in second place. 14 laps was the distance making the hole shot very important to the riders. The track rubbered up on the bottom, leaving very little room to pass on the 3/8’s mile track. Harley’s top rider Baker found some bite on the high side and drove past Meese for the lead and win in heat race number one. Cory Texter and his Sister Shanya Texter were both on hand for this grand event. 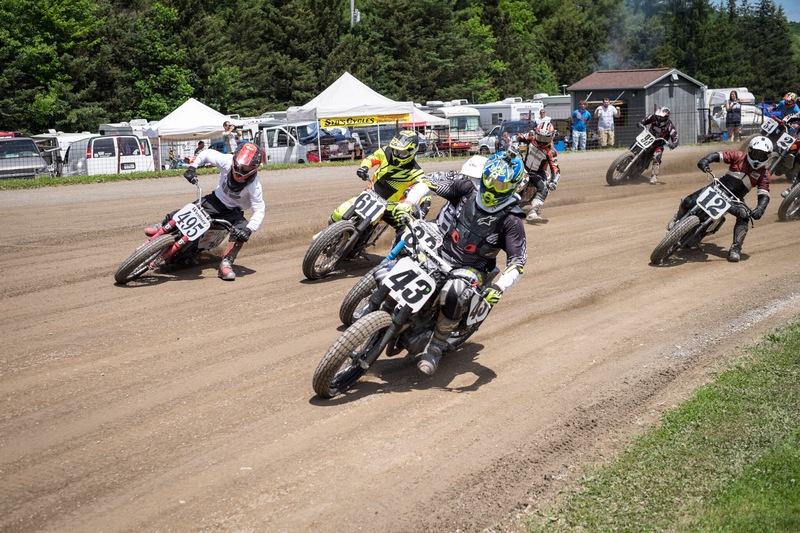 They are the first brother and sister to ever compete against each other at the XGames, check out my interviews with these to young guns in Flattrack racing. Shayna Texter, Cory Texter. Neither Cory or Shayna made the main, but they are great ambassadors for the sport. Next up was the LCQ, this was it for the rest of the riders. If you finish in the top two you move on to the main, if not, you put it on the trailer and have to wait until next year to try and win Gold. Ten laps is all the riders had to get into the last to spots in the main. Above Kenny Coolbeth Jr finished second to Australian rider #87 Micheal Kirkness, in the LCQ These two got out front early and protected their ever important positions. Five of the 24 riders that were participating in this prime time event I have covered at Square Deal Riders in update NY. 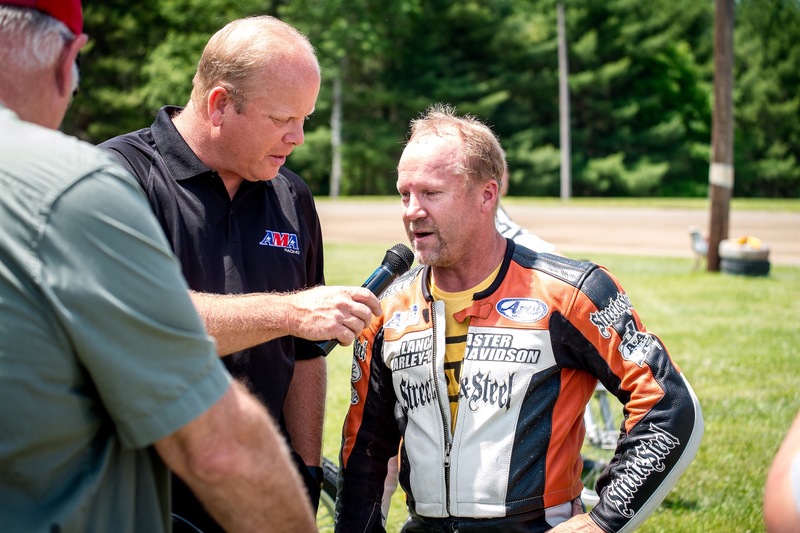 I have had the privlage of interviewing these riders as well as capturing wonderful images of them piloting their machines around the 1/4 mile track at SDR. ESPN did a great job of covering the racing, with a couple of cool behind the scenes pieces with the Texter sibIings and Brad “The Bullet” Baker. 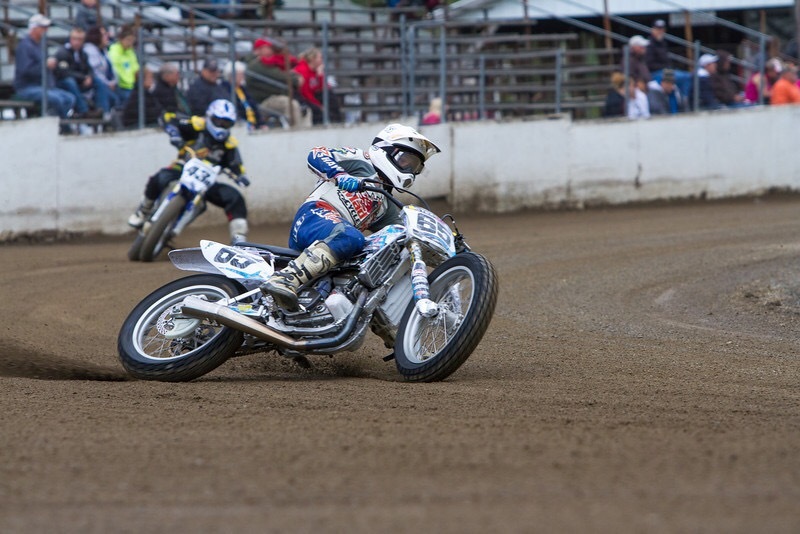 It was good to see them show who these riders are to the huge audience that have never seen Flattrack racing before. Riders lined up at the starting gate with their mechanics doing final adjustments to their bikes before they raced for the Gold. The Gate dropped, and the engines came roaring to life heading off into turn one. Scottie Deubler was in the booth calling the race for ESPN. Scottie does a great job announcing, helping new fans understand what was going on out there on the track during the event. # 1 Meese grabbed the hole shot followed close by Smith, Baker, Lewis close behind. Baker made a nice pass for the lead on lap two with Mees charging right back by him to wrestle the lead back from the former champion. The two battled back and forth for the first few laps. Mees was running the bottom on the very fine black groove, and Baker was running the top trying to build momentum to get around the defending champions Harley. Meanwhile the mile expert Bryan Smith was closing in on the leaders bringing along Johnny Lewis on his Ducati. Bakers efforts around the top wasn’t paying off, as Smith and Lewis got by him on the bottom around lap 4. Sammy Halbert took advantage of a slip by Lewis, grabbing the third spot around the 1/2 way mark. ” The Bullet” made his way back to fourth for a bit racing with Lewis for a few laps, making for some great racing behind the leaders. Mees pulled out a couple bike lengths on both Smith and Halbert. Sammy was trying everything to get around the green Kawisaki of Smith. He looked high he looked low, but Smith made his bike really wide for the last few laps. #1 Mees was out front when the white flag flew, with Smith and Helbert in the final two metal positions. Mees was only 3/8’s of a mile from Gold, entered turn one well on his way to the win, when he slowed bring everybody to their feet. With Smith and Sammy swerving low to avoid hitting the bike of Mees. The # 1 bike popped his chain off with 1/2 a lap to go. What a huge bummer for the Defending AMA Grand National Champion. Jared’s wife Nicole Mees ( a fellow rider) looked on as her husbands bike slowed down the back stretch. 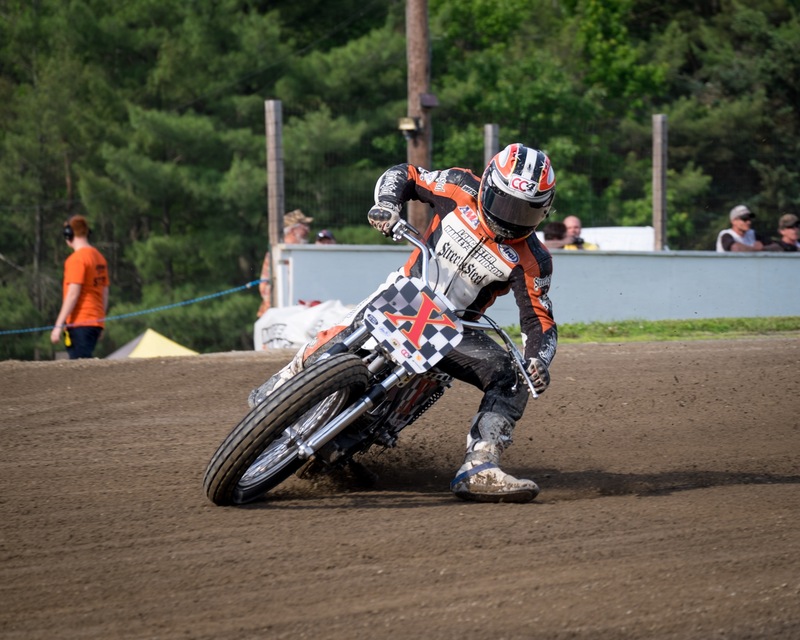 Great coverage from ESPN, and good racing from the riders, made for a great XGames Debut for Flattrack racing. 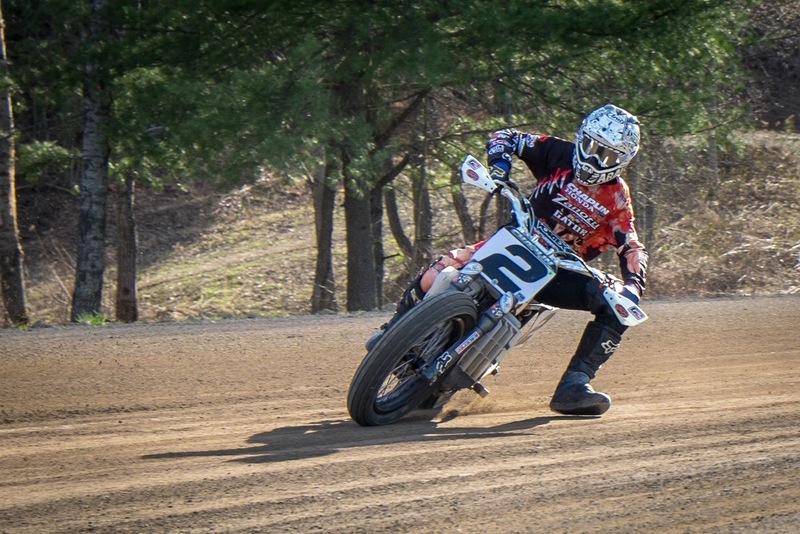 I hope this will move Flattrack Motorcycle racing up a few more notches in motor sports.